Nantwich Historical Society hosted a talk by David Rowsell entitled, ‘Operation Anthropoid – in Cholmondeley and Czechoslovakia’, on Wednesday 30th March 2016 at Nantwich Methodist Church Centre. David Rowsell is Principal at the British International School of Washington DC in the USA and flew over with his wife to visit family and deliver the insightful talk. David has previously been Principal at the English International School in Prague and had visited and taken photographs at several of the locations that featured in his presentation. David informed the audience that Operation Anthropoid was the code name for the assassination of the German SS General Reinhard Heydrich, who was one of the main architects of the Holocaust. The Free Czechoslovak Army were based at Cholmondeley Castle in the summer of 1940, and it was from these men that two were chosen to be sent back to Czechoslovakia to carry out this daring mission. The two men chosen were Warrant officers, Jan Kubiš and Jozef Gabčík. Kubiš and Gabčík were parachuted into Czechoslovakia on 28th December 1941. They carried out Operation Anthropoid on 27th May 1942 by ambushing Heydrich’s car on the streets of Prague. Although Gabčík’s Bren gun jammed, the explosion from a grenade hurled by Kubiš fatally injured Heydrich and he died one week later. Kubiš and Gabčík escaped the scene of the attack. However, they both tragically died weeks later when their hideout location in a Prague church was betrayed by collaborator Karel Čurda, who had also been based at Cholmondeley. Several thousand people were killed in Nazi retaliation to the assassination. Coincidentally, there are two movies due out this year relating to Operation Anthropoid: ‘Anthropoid’ starring Cillian Murphy and Toby Jones and ‘HHhH’ starring Rosamund Pike and Jack O'Connell. Nantwich Historical Society meets at Nantwich Methodist Church Centre (Hospital St, Nantwich CW5 5RP) on the first Wednesday of each month, from October to April. Doors open at 7.15pm and meetings begin at 7.45pm. For further information please phone: 01270 560 434. The 20th Nantwich Jazz, Blues & Music Festival - http://www.nantwichjazz.com/ - took place over the Easter weekend. Organisers expected over 40,000 people to attend the festival during its five day period (Thursday 24th to Monday 28th March 2016) with over 100 performances at sixteen venues in Nantwich. Entry to the majority of the pub gigs was via a festival wristband. Headline acts included Big Country, FM, Kyla Brox, Red Stripe Band, Bad Manners and Nearly Dan. The festival is estimated to inject over £1 million into the town’s economy. Hack Green Secret Nuclear Bunker - http://www.hackgreen.co.uk/ - near Nantwich took visitors back in time over the Easter weekend. ‘The Soviet Threat’ event recreated what life was like either side of the Berlin Wall during the Cold War. There were armed troops patrolling the grounds, checkpoints and numerous military vehicles from both Western and Eastern forces. Inside the bunker there were troops keeping check on the opposition and any possible nuclear attacks, including re-enactors in full fallout uniforms and Geiger counters patrolling the corridors. The event, in its third year, was organised by Lucy Siebert, museum director at Hack Green Nuclear Bunker, and Eleanore Hill-Bruce of Plantagenet Events, along with keen local historians. Crewe Passion Play took place in Crewe town centre on Good Friday (25th March 2016). The play was organised by Love Crewe - http://www.lovecrewe.co.uk/ - which is composed of ten churches serving the Crewe area. The re-enactment recreated the sequence of events from the entry to Jerusalem, the Passover Meal, the Garden of Gethsemane, the Crucifixion to the Resurrection of Jesus Christ. The event lasted two hours and began with a gathering prayer at St Mary’s Church, then weaved around Crewe town centre, including Victoria Street, the Square and Market Street, before concluding at Victoria Square. Each sequence was narrated, contained hymns and was accompanied by guitarists. Hundreds of people attended the event. The script was written by Dr Stephen Berwind, Amy Devereux and Daniel Ruston. The event was supported by Manchester Metropolitan University (Cheshire Campus), Crewe Town Council, WHSmith (Crewe), along with volunteers and on-lookers. Celebrations will take place in local churches over the Easter weekend. The village of Audlem and the town of Sandbach have voted in favour of asking Cheshire East Council to apply their neighbourhood plans when deciding on future planning applications within the parish and town boundaries. Voting in two separate referendums took place on Thursday and the results have now been made public. There was a 42.86 per cent turn out in Audlem where 654 voted in favour and 22 against. Sandbach saw a turn out of 28.31 per cent with 3,941 voting in favour and 173 against. Neighbourhood plans are intended to help local people to have greater influence over planning decisions made in their area. They can help to protect communities from unplanned, unsustainable development. Councillor Ainsley Arnold, Cabinet member for housing and planning said: “It is very encouraging to see that so many Cheshire East residents have taken advantage of this opportunity and clearly wish to engage in the planning process by having some influence over future decisions that can affect the place where they live. “We are a ‘residents first’ authority and by promoting the idea of neighbourhood plan consultation and referendum, we are giving our residents a unique opportunity to be a part of a democratic process and have a say in how their town or village could develop. “There are many more referendums to come in Cheshire East and the results we have had so far demonstrate that people do wish to embrace this process. More than 30 neighbourhood plans have been drawn up in the Borough by various towns and parish councils, making Cheshire East one of the most proactive in the country for offering this choice to residents. Referendums take place following a full consultation exercise within the community and after meticulous scrutiny of the plan by a planning examiner. The parishes of Bunbury and Brereton went to the polls on March 10 and have also voted in favour. One lucky Cheshire East resident could win £5,000 thanks to a national Council Tax promotion that Cheshire East Council has joined. The Council signed up to a campaign launched by Bacs Payment Schemes (Bacs), the not-for-profit organisation behind direct debit in the UK. To be in with a chance of winning the £5,000 prize, Cheshire residents must register to pay their Council Tax bill by direct debit before 5pm on September 1, 2016, either by signing up to direct debit online at www.cheshireeast.gov.uk/counciltax or calling 0300 123 5013 to arrange over the phone. Councillor Peter Groves, Cheshire East Council Cabinet member for finance and assets, said: “Direct debit is a simple, safe and secure means of payment, which is far more convenient for residents than other payment methods. It is also a much cheaper way for us to process payments and the money we save can be used for the benefit of local residents. This is the second time that Cheshire East has been involved in a Bacs campaign. The last campaign led to more than 2,000 residents joining the direct debit scheme. In Cheshire East, 76 per cent of residents are already signed up to pay for their Council Tax by direct debit, which is one of the highest percentages in the UK. It is hoped that this campaign will help to increase that figure. Don't lose your voice – check you are registered to vote! Cheshire East Council is calling on people to act now – so they don’t lose their voice in upcoming elections. And the message is: If you can’t vote, you haven’t got a voice. If you are not registered, you could miss out on being able to vote in the Police and Crime Commissioner (PCC) election on May 5. There will also be a national referendum on June 23, on whether or not the United Kingdom should remain in the European Union. Polling cards are being posted to adult residents this week. If you have not received your polling card by March 29, you should contact the Council to ensure you are registered to vote. Cheshire East Council is actively supporting the Electoral Commission’s drive to boost voter registration. The Electoral Commission is working in partnership with the National Union of Students to inspire young people to register ahead of the May 2016 polls. Cheshire East Council Chief Executive Mike Suarez, who is the Returning Officer for elections in the Borough, said: “Casting your vote is the lifeblood of a healthy and vibrant democracy – and you can’t vote if you aren’t registered. “It is really important that people don’t miss out on the opportunity to vote and thus have a voice on the important local, national and international issues that affect the daily lives of everyone. “Nationally, a quarter of single people and three out of 10 people aged 18 to 24 are not registered to vote – and we want to help change that and get more people registered. “Voting gives you a say on everything from roads and recycling, to community policing and international cooperation. The closing date for the receipt of applications to register your vote for the PCC election is Monday, April 18. Remember: registering your vote does not mean you have to – it just means you don’t lose out on the opportunity to do so. Cheshire East Council’s £15m state-of-the-art lifestyle centre will open its doors to the public on April 1 giving the people of Crewe the most modern combined leisure and community amenity in the country. Far more than a fitness facility, the building between Prince Albert Street and Lyon Street, will also house several customer-focused council services, including the town’s public library and a community hub where families and residents with special needs can access vital day-care support. A contact centre will help residents with queries about other Council services such as housing and council tax enquiries. The leisure side of the building will be open from 6.30 in the morning and swimmers will be able to enjoy a 25 metre, eight-lane swimming pool, while keep-fit enthusiasts can work out in a 100-station gym and fitness suite, containing the very latest in cardiovascular, body strengthening and functional training equipment. A multi-purpose sports hall can be adapted for a whole range of sports from five-a-side football to indoor bowls, plus special events, exhibitions and functions, even weddings. With a floor area of 7,600 square metres, Crewe Lifestyle Centre will represent a milestone in Cheshire East Council’s campaign to promote healthy living and provide a brand new, state-of-the-art sports and community complex in the heart of the town. Councillor Janet Clowes, Cabinet member for adult care and integration, said: “This is an inclusive provision for both the able-bodied and people with special needs. “Our designers, in partnership with service providers and users, have thought of everything that can help people with disabilities to share in all the benefits that this centre can offer. “Special pool lifts, ceiling tracking and ‘changing places’ facilities will enable the most severely disabled to enjoy their visit here. “Our community hub also has an excellent, well-fitted out sensory room, while the entire building has been designed specifically to be as dementia friendly as possible. Crewe Lifestyle Centre will replace several outdated pre-war buildings in the town such as the Flag Lane swimming baths and other old community-focused buildings, which have become costly to run and are no longer fit for purpose. The leisure side of the centre will be managed by Everybody Sport and Recreation, a self-governing charitable trust in charge of managing all the Borough’s leisure facilities on behalf of the Council. 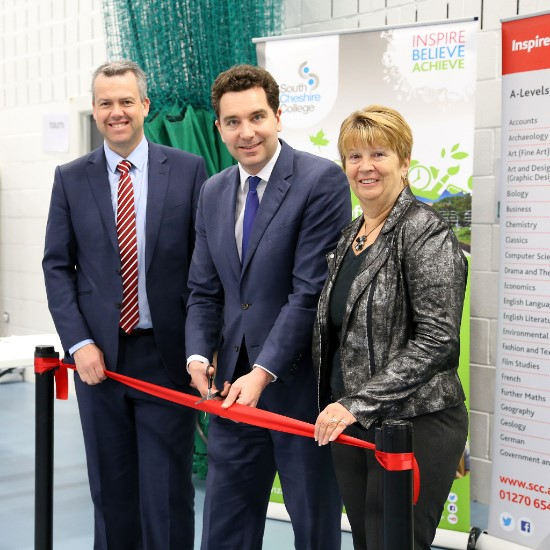 Councillor Sam Gardner, Cabinet member for leisure and open spaces, said: “The Council has delivered on its promise to the people of Crewe, providing an outstanding facility that brings so many sports, leisure and community facilities under one roof. “We believe in investing in the health and lifestyle of our families and individual residents and children, and will continue to do so by upgrading our other centres such as the Peter Mason Leisure Centre in Congleton where we intend to spend more than £8m on a new swimming pool together with other improvements. Councillor Andrew Kolker, Chairman of Everybody Sport and Recreation, said: “Crewe Lifestyle Centre represents the jewel in the crown of the trust’s 15 leisure sites that we manage, on behalf of the Council, for the benefit of the residents of Cheshire East. “We will offer all the affordable membership benefits associated with our existing centres and anyone who wishes to tour the centre can do so prior to its opening on April 1. The 35th South West Cheshire (Wistaston) Scout group hut - http://www.wistastonscoutgroup.org.uk - at Bluebell Wood, Elm Close, Wistaston is open to visitors every Saturday in March from 2pm to 5pm. The final visit day is Saturday 26th March 2016. The hut, officially opened on 25th September 1971, is to be demolished next month (April). The new hut, which will cost nearly £200,000, is to be built in its place and is due to open by Christmas this year. The facility is used by 35th South West Cheshire Beavers, Cubs and Scouts, along with an Explorers (14-18 year olds) group. Congratulations are due to all those who collected, subscribed and raised the enormous sum for the new building, which will involve Scouting for future generations. Former District Commissioner Gerald Newbrook has been on hand to answer questions about the hut and Scouting in general. Gerald was the first Scout in the South West Cheshire group in 1958 and is still involved in Scouting. He helped to setup the ‘Gang Show’ at the Crewe Lyceum Theatre, which this year is from 27th to 30th April (http://crewelyceum.co.uk). Visitors are able to view the kitchen, main hall, meeting room, and equipment store. There are also display boards showing architectural drawings of the new hut. Former members of the 35th South West Cheshire Scouting organisation are able to remember the many happy occasions and events which emanated from this building. So many memories. The clocks go forward at 01:00am on Sunday 27 March 2016 - as British Summer Time officially starts. With spring on the way it will soon be the perfect time for getting out on the motorbike - but firefighters are urging people to take extra care to make sure it, and you, are ready for the road. Statistics show that injuries to motorcyclists are out of proportion to their presence on our roads. Motorcyclists are just 1% of total road traffic, but account for 19% of all road user deaths. Cheshire Fire Authority is a step closer to realising its vision of safer communities as work begins on a new fire station and safety education centre in Lymm. Pupils from local schools joined Chair of Cheshire Fire Authority Cllr John Joyce and Deputy Chair Cllr Stef Nelson for the official ground-breaking of the new facility at the site off Cliff Lane. Fully committed to reducing its carbon footprint, Cheshire Fire and Rescue Service has taken delivery of twelve new electric vehicles to be deployed across Cheshire for support staff. The all-electric Nissan LEAF cars, distinctly liveried with the message Red Fire Engines, Green Values, underpin the Service’s environmental credentials and replace some of the existing fleet of petrol cars used to go from station to station and home visits in local communities. A firefighter from Cheshire is getting into gear to cycle over 400 miles and climb the Three Peaks for Cancer Research UK and the Fire Fighters Charity. 57 year old Carl Hanson set out on the epic challenge from Snowdonia to Ben Nevis on Wednesday 16 March 2016. S Club 7 band members Jo O'Meara and Bradley McIntosh performed as 'S Club Party' at 'The Studio Nightclub & Entertainment Venue' - http://www.thestudionantwich.co.uk/ - in Nantwich on Friday 18th March 2016. S Club 7 had four UK number one singles and sold over 10 million albums worldwide. Jo and Bradley posed for photographs with VIP fans, then moved to the stage in the large music and stage area. S Club Party's set contained several of S Club's biggest hits including ‘Never Had A Dream Come True’ and ‘Don't Stop Movin'’, before coming to a floor-filling finale with ‘Reach’. There was a disco after the gig. The concert was promoted by SOML Events. Council refuses to apply to list the historic Crewe Baths so Councillor applies to Historic England in effort to save the bath's historic exterior from demolition. UKIP Councillor Brian Silvester has applied for the exterior of Crewe Baths to be listed.He said,"I am angry that Cheshire East Council have refused to apply for it to be listed.Crewe Baths is a 1930's art deco building. Crewe has few historic buildings and even of those it has,many have been demolished over the years. At the very least the historic exterior front of the building should be retained in any future development.The baths are due to close shortly and be sold off when the new baths in the town centre become operative.I would urge local residents to write to the Council and to Historic England to ask for the historic exterior to be preserved and retained in any future development. See e-mail from Council and listing application below. Unfortunately, we are extremely pressed in terms of volume of work and do not presently have the resources to make a spot listing request to Historic England. However, other parties can also apply for buildings to be added to the statutory list. Consequently, If you think the building warrants listing then you can submit your request to them online using the following link https://historicengland.org.uk/listing/apply-for-listing/. I would comment however that when the building was placed on the local list some years ago, then subsequently included within the Local List SPD in 2010, the conservation officers involved at the time objectively assessed the building and are likely to have concluded that it did not warrant statutory listing. We will consider any future development proposals that we are consulted upon in the light of the local list status of the building/saved Policy BE13 of the adopted replacement local plan for Crewe & Nantwich 2005 and paragraph 135 of the NPPF. Teenager George Raiswell from Wistaston has once again organised a fund-raising activity at Wistaston Jubilee Tennis Club, Church Lane, Wistaston. In previous years the Shavington Academy year 10 pupil has organised a tennis tournament and a 12 hour ‘Tennisathon', raising hundreds of pounds in the process. Each participant paid a donation to play against each other. Eight players played fifty-eight games in total. The winning pair were Ben Reinhardt and Paul Sheeky, who won by a one game margin and received a shield donated by Concorde Trophies. George also organised the raffle prizes which were a hamper donated by Wistaston Jubilee Tennis Club members, a £10 voucher donated by Cheerbrook Farm, £10 voucher from Minshull's, 3 family tickets from Cotebrook Shire Horse Centre, a one hour reiki session from Cheshire Reiki & Wellbeing Therapy, a round of golf for 2 people from Queens Park Golf Club, a meet the meerkats experience from Zoo2U, and a Reaseheath Family Festival ticket from Reaseheath College. George’s mother - Julie - made sandwiches and a Victoria sponge cake for all participants. In total £131.25 was collected for Sport Relief, which raises money to help vulnerable people in both the UK and the world's poorest countries. George said, "I would like to thank everyone who played in the tournament and those who supported it. I would also like to thank all the generous contributors to the raffle. It was all for a very worthy cause”. Blood is something we all expect to be there for us when we need it, yet only 4% of us give blood - many people would not be alive today if it wasn't for the generosity of our donors. Every day 6,000 units of blood are needed by hospitals. Each unit of blood can save up to three lives. Could you donate some time to save a life? Crewe blood donation sessions - make an appointment today! All sessions held at Crewe Alex FC. Free car parking available. new and regular donors welcome. The Leader of Cheshire East Council has warmly welcomed the Chancellor’s backing for a high-speed rail line between Manchester and Leeds to boost connectivity and the economy of the North. The HS3 rail link has been described as a key part of the UK's largest investment in rail infrastructure since the Victorian era – and builds on the investment planned in HS2 to Crewe. George Osborne today unveiled a £300m Budget package to boost transport links in the ‘Northern Powerhouse’ in a move he has said would help create a ‘northern global powerhouse’. Mr Osborne committed the Government to taking forward HS3, with £60m to cut journey times to 30 minutes from their current 49. A full blueprint for HS3 will be drawn up by next year. He also announced £75m to develop plans for a trans-Pennine tunnel between Sheffield and Manchester and explore options for improvements to the M60 ring-road around Manchester, as well as the A66 and A69 coast-to-coast trunk roads further north. Highways England is to be given £161m to accelerate upgrades to the M62 Liverpool-Hull motorway. Councillor Rachel Bailey, Leader of Cheshire East Council, which has pushed hard for the creation of a strategic HS2 transport hub at Crewe, said: “This announcement is fantastic news for the whole region and I warmly welcome the Chancellor’s support for greater high-speed rail connectivity in the North of England. “This is the right strategic solution, not just for the North West and the wider North but the country as a whole. This is a good decision and will help unlock the potential of high-speed rail to rebalance our country’s economy. “The benefits HS3, HS2 and a strategic transport hub at Crewe will bring will be absolutely transformational for the local, regional and national economy and great news for jobs, business and growth in Cheshire East and the wider region. Last November, the Government announced it is committed to building HS2 high-speed rail via Crewe and will invest £5bn to help bring the project online six years early by 2027. An HS2 superhub at Crewe would help deliver more than 120,000 new jobs and more than 100,000 new homes across the Northern Gateway partnership by 2040. It is expected to bring £10bn of GVA a year to the Northern Gateway area. Because of this, the Council backed the creation of Crewe Engineering and Design UTC, which is due to open its doors to students this September. This will boost education and training in the area and broaden and raise the academic and vocational skills of the region’s young people, including the automotive and rail sectors. The mid-Cheshire towns, including Northwich, Winsford and Middlewich, will see significant economic gains from improved connectivity. HS2 will not only create better connectivity but also free up capacity on the West Coast Main Line for both passengers and growth in rail freight movements. Last June (2015), the Transport Secretary called for HS2 to be ‘fast tracked’ and indicated again that Crewe could become the first northern hub for HS2 before the 225mph service continues to Manchester. Previously, in October 2014, Sir David Higgins, Chairman of HS2 Ltd, announced Crewe as the preferred location for a North West Gateway ‘superhub’ north of Birmingham, which can be connected into the Northern Powerhouse. Firefighters want to thank the people of Alsager for their generosity at their recent charity car wash. Drivers turned out in force to support The Fire Fighters Charity. Car wash organiser, Firefighter Shaun Searle, said: "Firefighters and helpers with their buckets and sponges raised money for this worthy cause at the Station. We'd like to say a big thank you to everyone who helped us raise over £350, and, more importantly, for giving us the opportunity to give out vital road safety advice. Cheshire Chair of the Fire Fighters Charity and Deputy Chief Fire Officer Mark Cashin said, "It is testament to the support we have from the public when events such as this show how generous people can be as a magnificent total of £354.50 was raised on the day. Every dog owner will have to microchip their animal by April 6 under a new law intended to cut the rising number of strays in England and boost responsible pet ownership. Government figures reveal that nationally more than 100,000 dogs are dumped or lost each year – at a cost of more than £57m to the taxpayer and welfare charities. Councillor Paul Bates, Cheshire East Council Cabinet member in charge of communities and health, said: “As a dog owner and indeed the owner of a rescued stray dog, I wholeheartedly support this proposal. The change in the law means, from April 6, ALL dogs in England must be microchipped and registered with a ‘keeper’ on an approved database. All puppies must be chipped by the time they are eight weeks old and owner details must be updated when pets are sold. No dog is exempt from this requirement, unless certified as unfit by a vet on health grounds. The requirement for dogs to be microchipped is in addition to the requirement for a dog to have a collar and tag (with name and address information) when in a public place. Both make it easier to reunite a dog and owner in the event of it straying or getting lost. Failure to comply with the legislation could result in a £500 fine. CSE Awareness Day is March 18 and we are urging members of the public to show their support on social media by signing up to the Cheshire Thunderclap. National Child Sexual Exploitation Awareness Day aims to highlight the issues surrounding CSE; encouraging everyone to think, spot and speak out against abuse, and adopt a zero tolerance to adults developing inappropriate relationships with children, or children developing inappropriate relationships with other children. Thunderclap is the first-ever crowd speaking platform that helps people be heard by saying something together. It allows a single message to be mass-shared, flash mob-style, so it rises above the noise of your social networks. By boosting the signal at the same time, Thunderclap helps a single person create action and change like never before. You can sign up to our Thunderclap via your social media account, (it takes 30 seconds) and on the 18 March, Thunderclap on your behalf will post your support for CSE via your chosen social media account. We need 500 supporters for our message to be heard, so please sign up today and show your support. Cheshire East Council is supporting a national campaign launched by the Department for Education to tackle child abuse. The campaign ‘Together we can tackle child abuse’ encourages members of the public to report child abuse and neglect. It highlights that we all have a role to play in protecting children and young people in our local area. In 2014/15, more than 400,000 children in England were supported because someone noticed they needed help. Research shows that a third of people who suspect child abuse do nothing and a number of people do not act on their suspicions because they are worried about being wrong. Councillor Liz Durham, Cabinet member for children and families said: “All children have a right to be safe and should be protected from all forms of abuse and neglect. You don’t have to be absolutely certain about whether a child is being abused: if you have a feeling that something is not right, talk to our social care team who can explore it further. “Information is usually gathered from many sources and your concerns would form one part of a bigger picture. Children and families can be helped at an earlier stage with preventative support, if more members of the public share their concerns. Detective Superintendent Nigel Wenham, of Cheshire police, said: “Tackling abuse in all its forms, is a priority for Cheshire police. “Children and young people are exposed to exploitation and abuse in a variety of ways, including sexual abuse, physical abuse, emotional harm and neglect. Children and young people often don’t recognise or understand what’s happening to them until it’s too late. “We fully support this latest campaign, we are committed to working with the public and partners to prevent young people’s lives being shattered by abuse. Any campaign that can improve people’s knowledge and, in particular, parents’ awareness of what to look for if their child is being abused, plays an important role in tackling this type of crime. “If anyone suspects a child may be a victim of any form of child abuse then they should take action now. Do not be afraid to speak out and seek advice, the consequences of failing to act can be devastating. ‘An Evening with Tessa Sanderson’ sporting dinner took place at Nantwich Civic Hall on Friday 11th March 2016. Rob Sproston compered the event, which began with a delicious three-course dinner. Rob then held an in-depth talk with Tessa Sanderson CBE on the stage about her achievements in the javelin throw, which included participating in six Olympics and winning a gold medal at the 1984 Summer Olympics in Los Angeles. She has also won three gold medals at the Commonwealth Games. She was a key player and Team GB 2012 Ambassador for the Olympic Games in London. She has been awarded the MBE, OBE and CBE for her services to sport. She currently runs her own sports academy – The Tessa Sanderson Foundation and Academy http://tsfa.co.uk/ - to give new athletes and young people a chance in the world of sport. Questions from the audience were put to Tessa relating to her career and how she became so great in her chosen field. There was also the opportunity to see Tessa's 1984 Summer Olympics gold medal and pose for photographs. Comedian Jed Stone finished an enjoyable evening with his own brand of humour. Mayor of Nantwich, Councillor Andrew Martin, said, "It was fantastic to host an Olympic champion in the town. I hope everyone had an enjoyable evening, which will have raised lots of money for local charities." All money raised will be donated to the four charities chosen by the Mayor of Nantwich, Councillor Andrew Martin: Nantwich In Bloom, Nantwich Food Bank, Nantwich Players and Nantwich Museum. Welcome to this, my 168th news bulletin. This month, I’m urging Crewe and Nantwich residents to protect themselves against the threat of carbon monoxide (CO) poisoning, in support of a national awareness campaign. A total of 48,740 people in Crewe and Nantwich and over 30 million across the country are at risk of carbon monoxide poisoning, according to recent research from the Carbon Monoxide – Be Alarmed! campaign. Their study found that nearly half of the population does not have an audible carbon monoxide alarm, and four in ten people have not had their gas boiler serviced in the last year. Carbon monoxide has no smell, colour or taste, and the only way for people to protect themselves is to install an audible alarm. Carbon monoxide can be produced by any fuel-burning appliance such as a boiler or cooker, or an open fire that is faulty or doesn’t have adequate ventilation. That’s why I am supporting the call from the Carbon Monoxide – Be Alarmed! campaign to make 2016 the year everyone protects themselves from this silent killer. The campaign urges everyone to fit and maintain an audible carbon monoxide alarm and ensure that all fuel-burning appliances are serviced annually by a registered and qualified engineer. You can read more about making sure that your home is safe on the campaign’s website. Thanks to everyone who participated in the 'Clean for the Queen' weekend of tidying, cleaning-up and litter picking. 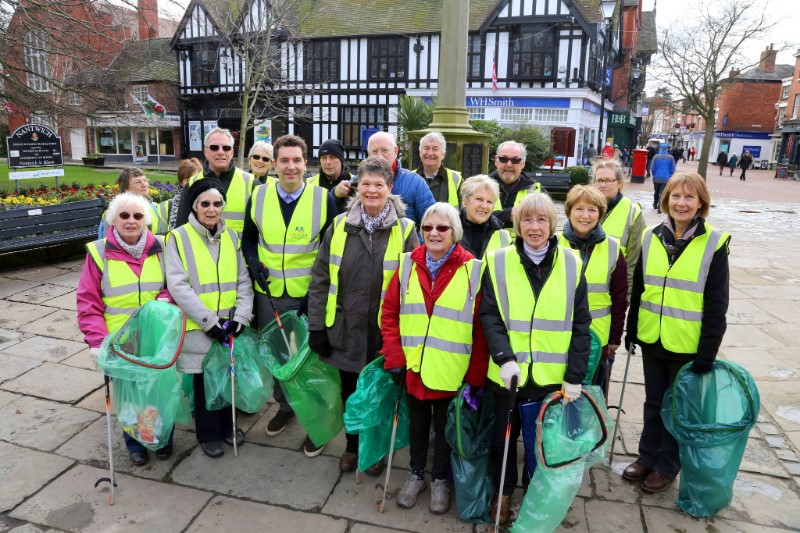 Both the Crewe Clean Team and Nantwich litter group were out in force last Saturday, and both groups of volunteers work all-year-round to keep our public spaces tidy and waste-free, so if you'd like to be put in touch with organisers, please let me know. Attended the ground-breaking ceremony for the campus of the new Crewe University Technical College. Celebrated, with staff and guests, the topping-out of Bentley's new £40m headquarters in Crewe, the home of Bentley. Visited Adelaide School in Crewe, where I spoke to pupils and staff about the school's 'nurture group' ethos. Welcomed some of our fantastic Crewe and Nantwich businesses, including Chatwin's, Mornflake, and Joseph Heler Cheeses, to the Houses of Parliament for Cheshire Food and Drink Day, a celebration of our county's food producers. Joined team leader Joyce Webb and the volunteers of the Nantwich Litter Group on a litter pick as part of the 'Clean for the Queen' weekend. Launched my fundraising page for this year's London Marathon, which I will be running in support of The Christie. Cut the ribbon at the 2016 Employment and higher Education Fair at South Cheshire College. ...and today I will be visiting Bentley Motors' apprenticeships open day at Pym's lane, in advance of the next wave of apprentice recruitment. I was delighted to work with South Cheshire College and the South Cheshire Chamber on this week's Employment and Higher Education Fair. The event brought together jobseekers and students with local businesses and recruiters, with job opportunities, apprenticeships and university courses all on offer. 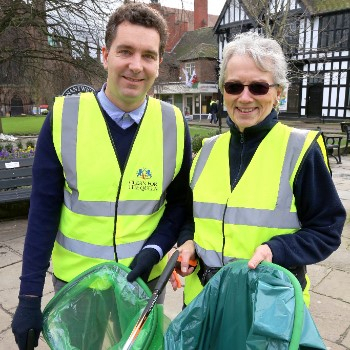 Nantwich News: Nantwich Litter Group's latest recruit Edward Timpson pitched in as volunteers cleaned the town's streets as part of the national Clean for the Queen weekend. 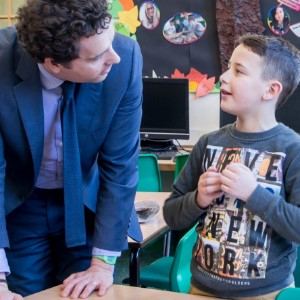 Crewe Chronicle: Edward Timpson MP visited Adelaide School in Crewe, accompanied by the Chief Executive of the UK charity, the Nurture Group Network. 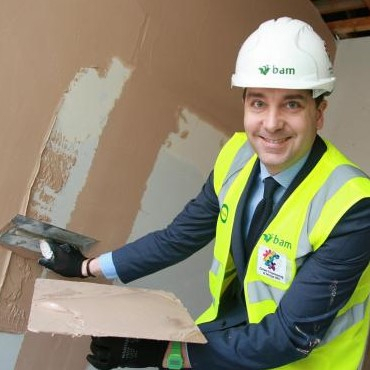 Crewe Guardian: Students, parents and MP Edward Timpson came to see the progress on the site of the Crewe Engineering and Design University Technical College campus. Cheshire East Council trading standards officers have seized cigarettes and tobacco worth more than £9,000 during a swoop against suspected fraudsters. More than 20,000 cigarettes and 5kg of rolling tobacco were uncovered during raids on seven properties in Crewe (Monday, Feb 29) coordinated by the Chartered Trading Standards Institute (CTSI) and supported by the Department of Health. Officers and sniffer dogs discovered concealed stashes of tobacco at five of the premises, with products hidden in various areas, including a false wall and a freezer. The intelligence-led ‘Operation Henry 2’ has been targeting illicit tobacco supplies in nine regions of England using specialist tobacco detection dogs. The seizure included non-duty-paid tobacco and counterfeit tobacco, which cannot be legally sold in the UK. CTSI chief executive Leon Livermore said: “The illegal tobacco trade costs taxpayers about £2 billion per year in lost revenue and is known to fund organised crime networks and criminal gang activity. “About 80,000 people die from smoking-related diseases each year in England alone, costing the overstretched NHS an estimated £2bn. “Together, we are winning the battle and figures show that the market share of illicit cigarettes has dropped from 21 per cent to nine per cent in the last decade. Richard Las, deputy director of fraud and investigation service at HM Revenue and Customs (HMRC), said: “HMRC works closely with other enforcement agencies to crack down on illicit tobacco in the UK. “Seizing illicit product is only one of the tools used. The focus is on using a range of interventions, from penalties to prosecutions, to encourage compliance and maximise deterrent. Launched last year and supported by the Department of Health, Operation Henry was the first large-scale coordinated trading standards investigation of its kind to tackle the supply of illegal tobacco. It has resulted in the seizure of more than 2.5 million cigarettes worth £614,488. Experts from the world of business will be staging a breakfast seminar at Alderley Park, supported by Cheshire East Council and The University of Manchester. All sectors of business are invited to register to attend the session which will tackle many of the challenges faced by companies wanting to expand or develop new concepts and products. The panel of experts will include Julian Cobley, head of investment at Cheshire East Council, Kris Matykiewicz, head of business engagement at The University of Manchester, Anne Milligan, the university’s employability manager, Saqab Rasul, SME and knowledge exchange manager at the university and Christian Stephenson, director of research and development at Crawford Healthcare. Julian Cobley said: “Whether you are a business wanting to make improvements, undertake research and development, take new ideas to the market or gain knowledge from experts in the field, this event will give you answers to so many of the questions that confront you. “Cheshire East has a strong and growing economy with a rich cross section of world leading, established businesses, SMEs and start ups. “The pharmaceuticals and life sciences sector is an example and is one of the many knowledge-based sectors seeing an explosion in growth, with seven times the number employed in the Borough compared to the national average. “GVA from this sector alone is estimated to be around £2.2bn across Cheshire and Warrington. Representatives from the university will introduce the opportunities it can offer to businesses including advice and support and how to access the talents and knowledge of students and graduates, plus information about internships and placements. The event starts at 8am on Thursday March 10, and concludes at 10.30 following a networking opportunity. Cheshire East Council has been commended by a government minister for its work supporting the life science sector. The Council has led the efforts of a senior group of stakeholders from across the country to encourage the growth and expansion of the life science sector. Cheshire East worked with partners in Wales, Kent and London, and built on the experience gained through supporting the growth of Alderley Park and the Cheshire science corridor. A ‘toolkit’ has been developed to help companies in the sector and stakeholders from their local areas make key decisions on how to maximise the potential of existing sites and to assist them when considering relocation or opening new sites. These decisions will boost the local economy and potentially create more jobs, as well as helping the UK maintain its global competitiveness. George Freeman MP also launched a new initiative to designate areas as ‘life science opportunity zones’ at the event at AstraZeneca’s former site at Charnwood, in Leicestershire yesterday. This will see major life science sites recognised for the contribution they make to the UK’s science industry. The Council is working actively with the Office for Life Sciences to put forward AstraZeneca’s site at Macclesfield, given its national importance one of the largest sites for pharmaceutical manufacturing in the country. Speaking alongside the minister at the launch, Councillor Don Stockton, Cheshire East Council Cabinet member for regeneration, said: “The Council has worked closely with a number of partners to develop this toolkit, which we hope will be of great benefit. Our continued support for the growth of Alderley Park as a world-class science hub and our work in strengthening the Cheshire science corridor means that we have gathered useful knowledge and experience of the opportunities that exist for the sector in the UK. “When this is combined with the experiences of our private sector partners and other local authorities elsewhere, this provides a unique and valuable resource. Cheshire East Council launches a six-week consultation on its revised Local Plan Strategy tomorrow – to allow the public to have their say. The finalised blueprint will shape development across the Borough up to 2030. The consultation will run from March 4 to April 19 2016, and follows the plan’s approval by full Council on February 26. The focus will be on the changes the Council now proposes to the plan it originally submitted to the Secretary of State in May 2014. This includes additional and amended strategic site allocations. A significant amount of detailed research and evidence has been gathered to inform the amended document and this round of consultation seeks to capture the views of the public on the changes made. The Council is then due to submit the Local Plan Strategy, with any amendments, to the Planning Inspector in the summer (2016). Councillor Ainsley Arnold, who is now overseeing the Local Plan process, said: “The Local Plan Strategy is the Council’s most important tool for shaping development in Cheshire East up to 2030. “The very positive views expressed by the Planning Inspector have enabled the Council to make amendments to our Local Plan with confidence and publish these for public consultation. This includes a comprehensive suite of development sites to accommodate the larger scale of growth now expected and planned for in the Borough. “The Inspector has confirmed that he is content with the Council’s proposed arrangements for public consultation on the proposed changes to the submitted plan. “Following a period of full consultation during the next six weeks, further examination hearings are expected to be held in early autumn. “There has been a tremendous response from residents and other stakeholders during nine previous rounds of public consultations on our Local Plan proposals. “To date, we have received more than 40,000 responses to our draft Local Plan. This is an unprecedented amount of interest in a council consultation process and I hope this additional period of consultation will allow everyone to feel they have had time and opportunity to have their say. ● Replacement of the new green belt between Crewe and Nantwich with a revised strategic green-gap policy. These revisions were endorsed by the Council’s strategic planning board and Cabinet before being voted through by full Council on February 26. Every comment, objection or expression of support for the Local Plan has been recorded on the Council’s consultation database – and so we have a clear picture about what has been said so far on the plan. Alternatively, you can fill in a comment form at your local library, Cheshire East Council’s headquarters in Sandbach or customer service points at Macclesfield Town Hall and the Municipal Buildings in Crewe. A £30m life sciences fund recently launched in Cheshire East has sealed its first investment deals – at Alderley Park and in Manchester. Greater Manchester and Cheshire Life Sciences Fund, a partnership which includes Cheshire East Council and managed by Capital Ventures that targets exciting life-science investments in the Greater Manchester and Cheshire regions, has invested in cancer therapy firm Pronec, based in Alderley Park and Manchester-based start-up Biorelate. It marks another step forward towards delivering 7,000 new jobs in life sciences at the former AstraZeneca site at Alderley Park. In 2012, pharmaceuticals giant AstraZeneca announced its decision to relocate its R&D to Cambridge. Cheshire East Council is part of the partnership team that launched, at Alderley Park in September 2015, a new fund to support growing businesses in the region’s burgeoning life sciences sector. The Greater Manchester and Cheshire Life Sciences Fund has already raised more than £30m – and this is expected to grow to around £45m. Councillor Peter Groves, Cheshire East Council Cabinet member for finance and assets, said: “This is excellent news for Cheshire East and the wider region. I’m delighted that the fund has successfully completed two seed investments in two very exciting and innovative companies. “Cancer therapy company Pronec and Biorelate, which provides biomedical knowledge databases, are both recent start-ups that have already made excellent progress. Cheshire East Council has invested £5m in the Greater Manchester and Cheshire Life Sciences Fund. A minimum of £10m of the total fund will be invested in Alderley Park, with a further £8m ring-fenced for the wider Cheshire and Warrington area. The fund has seen a lot of interest among a wide range of life-science businesses, both in the region and beyond, who are attracted by the world-leading science facilities and funding opportunities in Greater Manchester and Cheshire. In November 2015, the hi-tech life sciences hub at Alderley Park was unveiled by the Chancellor as part of a new enterprise zone to boost science investment and jobs in the region. Less than a year ago, the then Leader of Cheshire East Council, Councillor Michael Jones told the full council, the Conservative-led authority planned not just to freeze council tax for 2015/16 but for the following year also. “We are the first Council in the country to do this,” he told the meeting at Sandbach Town Hall. As with so many of Cllr Jones promises, this promise was just hot air.The Tories went into the election only months ago promising no Council Tax increases for two years but now they are going to increase Council tax by nearly 4%.Most people have not had a increase in their wage/salary for years. They have to make do with what they have and make savings where they can.The Council should be doing the same. Sadly Cheshire East are not alone in increasing the Council Tax.Both the Cheshire Police and Fire Authorities have agreed inflation busting Council Tax Increases. Also many Parish/Town Councils are increasing the Council tax as much as a whopping 30%. Last year I voted for no Council Tax increase and would do the same this year if I had the opportunity. UKIP believe in keeping the Council Tax down..None of the current Cheshire East Councillors seriously want to keep the Council Tax down. It is about time that Cheshire East slashed the fat cat salaries that go on rising and cut out wasteful spending. For example, they have spent £5 million and an incredible 7 years on the non existent Local Plan. It is no wonder that residents are cynical about those Conservative politicians who scatter down promises like confetti before an election but then proceed to do the opposite when the votes have been safely counted.It is a great shame that there aren't annual elections in Cheshire East. If there was, the electors would be able to throw out the Councillors who have so blatantly broken their promises and let down their constituents. This special Alert message has been sent to you to update you on the latest results of an independent assessment of Cheshire Constabulary. We are pleased to announce that we have been acknowledged for delivering an ‘excellent performance’. Today (Thursday 25th February) Her Majesty's Inspectorate of Constabulary (HMIC) publishes its national state of policing report. This national report comes on the back of the publication of all PEEL inspections and is accompanied by an assessment of each force’s overall performance. We have been highly praised by HMIC and the results of this independent assessment show that Cheshire Constabulary is one of the best performing forces in the country. We have been rated ‘outstanding’ overall for Efficiency and ‘good’ overall for Legitimacy and Effectiveness. In particular HMIC has commended the force for its excellent performance in keeping people safe and reducing crime and said it is extremely pleased with the progress Cheshire Constabulary has made in 2015. Chief Constable Simon Byrne said: "The results of this independent assessment show that Cheshire Constabulary is one of the best performing forces in the country. This is fantastic news for us as a force and for the public of Cheshire and reflects the hard work and commitment of every officer and member of staff including the volunteers who support us on a daily basis. Police & Crime Commissioner for Cheshire John Dwyer said: “The results of the independent inspection of policing are fantastic news for the people of Cheshire. It’s been a challenging few years financially but I have been determined that the frontline is protected. It’s because of this that I commissioned a root-and-branch review, which has enabled investment into the frontline. “We are now in a unique position as crime continues to fall, and is currently at its lowest for 25 years. And where it does occur we have some of our best ever solved rates. Full details of Cheshire’s assessment can be seen on the HMIC website. Cheshire East Council has backed its revised Local Plan Strategy to shape development across the Borough up to 2030. The document was successfully passed by a vote of Full Council on Friday (Feb 26). The blueprint will now go forward to six weeks of extensive public consultation running from March 4 to April 19, 2016 with the focus being on the changes the Council now proposes to the plan it originally submitted to the Secretary of State in May 2014. This will include additional and amended strategic site allocations. Newly-elected Cheshire East Council Leader Rachel Bailey, who is the Cabinet member in charge of the Local Plan, said: “I am delighted Council has accepted this amended plan and I look forward to it being put before the people of Cheshire East for their views. “The very positive views expressed by the Inspector have enabled the Council to make amendments to our Local Plan with confidence and publish these for public consultation. “This includes a comprehensive suite of development sites to accommodate the larger scale of growth now expected and planned for in the Borough. Following a period of full consultation, during March and April, further examination hearings are expected to be held in early autumn. “I would like to reassure our residents that this Council has been doing – and will continue to do – everything possible to progress the Local Plan, speed up its completion and move towards its successful adoption. Planning Inspector Stephen Pratt issued his ‘further interim views’ on the submitted plan in December 2015, following the resumption of the Local Plan examination in the preceding August and the holding of seven days of hearings in October. These broadly supported the further evidential work carried out by the Council over the past 12 months in relation to the Local Plan. These revisions were endorsed by the Council’s strategic planning board last week and Cabinet on Tuesday (Feb 23, 2016) before being voted through by Full Council (Friday).